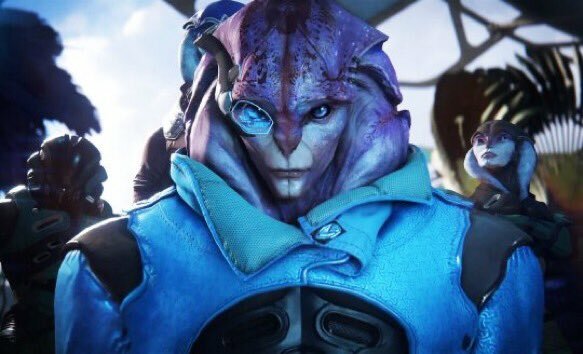 Jaal is a Character in Mass Effect Andromeda. He is a member of the Angara, one of the new Andromeda Races you will encounter. He has been seen in trailers leading up to the release of the game. A lieutenant in the Angaran Resistance, Jaal comes from an enormous and famous family of fighters. He’s a self-taught modder and tech-head who likes to take things apart in his spare time. Jaal, like all angara, is free with his emotions and will always let you know how he feels – good or bad. Although he is respected and admired, Jaal searches for a place he can truly belong. Jaal will join the team during A Trail of Hope mission on Aya. Recruit Jaal, visit Aya and talk to him in the Tempest Tech Lab. Choose "One more thing." option. Talk to Jaal anywhere and choose "Interested?" option. After completing conversation with Akksul on Vicdon go back to the Tempest Storage Room and talk to Jaal. Accept his Loyalty Mission. Visit Kadara and talk to him in the Tempest Tech Lab. Choose "I think you're special." option. Finish Hunting the Archon, complete his Loyalty Mission, receive an email from Jaal and have him in party. Go to the Havarl Mom's House and speak with Jaal. Can commit to relationship here. Complete the Journey to Meridian and and speak with Jaal in the Tempest Tech Lab. Choose "I adore you." option. Then talk to him in the Tempest Tech Lab again. If you committed to Jaal go to Aya Hub: By Waterfall and speak with him. Choose Narrative Action. Hey, I just walked in on Jaal making gifts for the crew. Anyone knows what&apos;s a good idea and what&apos;s not?